Spatial Data Infrastructures have evolved from concepts into reality in the last decade. However, they are still focused on data retrieval and visualization. To proceed in the direction of a true Spatial Information Infrastructure, it is evident to process geodata to geoinformation. This book goes beyond chaining freely available Geoprocessing Web Services and assumes that not all services are freely available. Specific functionalities of these distributed Geoprocessing Web Services might be secured and need to be accessed in an on-demand fashion. 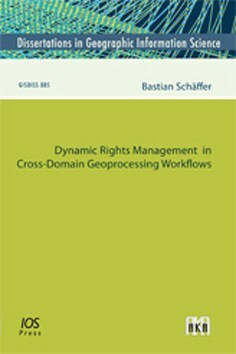 A concept is presented which allows the dynamic access to and chaining of secured Geoprocessing Web Services without a priori established rights or direct trust relationships in contradiction to the classical Role-Based Access Control scheme. The three different workflow patterns—Transparent, Translucent and Opaque—are analyzed on the basis of a real-world scenario. A static model, a trust model and a dynamic model are developed for each of the three workflow patterns. In general, the concepts presented in this thesis can be seen as enablers for mapping full business processes in Spatial Information Infrastructures across enterprise borders. This aspect forms an important step towards commercial applications in Spatial Information Infrastructures.